Casablanca is not as attractive to tourists as the charismatic Marrakech or the capital, Rabat, but there are still sightseeing opportunities for travellers passing through and a day or two in Casablanca won't go unrewarded. 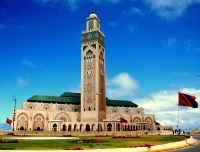 The main landmark is the enormous King Hassan II Mosque, perched over the ocean. This is one of the largest mosques in the world and, unusually, is open to non-Muslims. The Shrine of Sidi Abderrahman, built on a rock out at sea and only accessible at low tide, is also a fascinating site, but regrettably non-Muslims cannot enter; however, it is still worth exploring the little village which has grown around the shrine. Although not quite as majestic as the medinas of Fez or Marrakech, the ancient walled part of Casablanca is still definitely worth a visit. This part of town predates the French protectorate and has undergone work to restore the bastion and clock tower to their former glory. For a taste of modern Morocco, enjoy the restaurants, shops, and views of the Casablanca Twin Centre, the tallest buildings in the country. Good museums in Casablanca include the Musée Abderrahman Slaoui, which has a wonderful art collection, and the Museum of Moroccan Judaism, which offers some useful insight into Jewish history in North Africa. We are looking for contributors for our Casablanca travel guide. If you are a local, a regular traveller to Casablanca or a travel professional with time to contribute and answer occasional forum questions, please contact us.